You like your undead slow or sprinting? One of the world’s greatest controversies, right up there with the best M&M color (it’s blue), revolves around zombies. In one corner we have the walking, shuffling, easily confused undead of nearly every zombie movie ever made. They are a threat to the elderly and anyone not paying attention when stepping through a shattered storefront. In the other corner we have the running, jumping, finely tuned dead of “28 Days” and “World War Z.” In this version, only the trim, fit and athletic part of the population succumb to various zombie-causing diseases, and once undead they are even better athletes. If these zombies carved out their own country, they would dominate winter and summer Olympics, and not simply by eating the brains of other competitors (though they’d do that too). The world was perfectly happy with lumbering zombies since it made sense your body should suffer some sort of post-mortem penalty. Death should not reinvigorate you like some sort of Red Bull rebirth. I count myself firmly in the camp of the walking, tripping, “I’ve fallen and I can’t get up” zombies. The process allows for survivors, thinning the herd only of those unwise enough to look from grandma in a cellar filled with shelves upon view-blocking shelves of canned peaches. “Grandma, you down here? Because we need to get you somewhere safe.” Indeed. The sprinting, victim-seeking zombie missiles are going to need a lot of food to keep their energy up. The constant search for calories could gut the food supply in a matter of years, making the zombie apocalypse not so survivable to the disappointment of thousands of doomsday preppers. I decided to split the zombie difference in “Dead Jed.” Jed can keep up a decent jogging pace, but at a sprint he is far more likely to lose a limb. And while he doesn’t slur his words and uses usually impeccable grammar, he’s not prone to screaming incomprehensibly whenever he sees a stranger (and eats him). Then again, Jed is the only one of his kind and thus can set the zombie bar wherever he wants. I enjoy reading dedications in books. They give an insight into the authors, and you wonder how and why these particular dedications came about. Sometimes all you see is a name, wondering what made the relationship special enough to earn a dedication. Others aren’t mysterious at all, perhaps a mom or spouse (based on the hundreds of dedications I’ve seen, I’d give the edge to spouses, followed in rapid succession by children and moms). But can you dedicate a book to a special day? Or an event? Or a memory? Today I am reminded of how the subject of my first dedication was very easy to choose. As soon as I admitted to Paula I was writing “Dead Jed,” I knew she’d be on me to finish. Her efforts did not disappoint, as she demanded to read a new chapter each week. And if I did not have something to show her, I received stern looks and a quick “Turn off football and go write. Now” order. She was with me through thick and thin, and we naturally assumed we’d live out our lives together. Paula would have been 53 today. Cancer stole her from me nearly four years ago. When I signed with an agent, she was the first person I told. But she left before we found a publishing deal, the book hitting shelves a year after that. I miss Paula every day, but especially today. I’ve grown up firm in the belief every kid would benefit from a pet. My first dog was Misty, a Corgi mix who was so protective of her leash, she would grown at us when we approached. It made it very difficult when we wanted to walk her. My current dog is Sandy, an Australian kelpie mix whose favorite hobby is sniffing. I wish I could wear her nose for a while just to see what the big deal is. I knkow pizza smells good, but maybne it;s incredible with a nose a thousand times more powerful. When I began to think of a storyline for the second Dead Jed book, thoughts didn’t include a dog. It was not until I was a chapter or so in that I wondered, “What kind of dog would a zombie like? A golden retriever, to fetch any lost limbs? Or a Shih Tzu, because it could lend itself to so many edging-on-bad-taste puns?” Then I realized what Jed needed – a zombie dog, an animal he could truly relate to. But just how does one go about finding a zombie dog? I’ve visited many an animal shelter and have never seen any undead canines. Quite honestly, I consider that a good thing. There are inherent problems with having a zombie dog. When he sheds, it’s more than just fur. And zombie dogs have to be very careful at a dog park, since a playful black lab could nab a zombie tail and take off with it, believing it to be a cool toy. Still, what zombie boy wouldn’t want a best friend zombie dog? You can see how it will turn out in December when “Dead Jed 2: Dawn of the Jed” is published. 10. Nothing says “Personal accomplishment” like stringing together 75,000 words that take up way more space in your sock drawer than you ever dreamed. 9. Beats spending hours volunteering at a food bank or raising your kids. 7. Great way to get rich, if what happens to one author in 10 millions happens to you too. 6. No better way to get out of chores than to say, “Sorry, this is my dedicated writing time,” because every time can be dedicated writing time. 5. The “I’m on deadline” excuse will get you out of school plays, family gatherings and other annoying life events. 4. Chicks dig guys who deal with mid-life crises by writing books. That’s our story and we’re sticking to it. 2. Unsold books make great attic insulation. 1. Will finally allow you to order return-address labels with “Author” in front of your name. Forget fame and fortune, which is convenient for me as I have neither. My greatest moment as an author occurred at the back of an independent bookstore where four rows of folding chairs were set up, the first two rows striped with yellow crepe to mark the “Members Only” section. 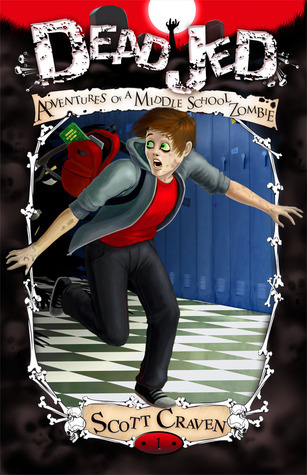 To the left of the small foot-high stage, a display table held several copies of “Dead Jed: Adventures of a Middle School Zombie,” arranged neatly in low stacks. In the middle was a photo of an old guy attempting to look important. A short biography under “Meet the author” described this gentleman as me. It was all fairly embarrassing. Until I saw the girl in the front row, sitting on crepe paper and not caring, flipping through various screens on her phone. It wasn’t who she was or what she was doing. It was the paperback book on her lap, the cover creased, the pages fluffed like an accordion. That was a book that had been read. And it felt amazing. A month ago, I’d been invited to Club Read, a monthly meeting of kids who loved to read. Changing Hands in Tempe urged members to read “Dead Jed” before my appearance, but I had no idea if they’d follow instructions, or if it would be like the mom-based book clubs that were popular more for the excuse to start drinking in the early afternoon. I brought a copy of “Dead Jed” with me, marking passages I intended to read. Arriving 15 minutes early, I met Eddie, the Club Read post. He told me to be prepared for anything, and that while it was smart to read certain passages, the kids usually asked enough questions to keep it going for the full hour. The members slowly filtered in, parents telling them to be good as they headed back home. And nearly all of the kids carried “Dead Jed,” each one looking beautifully ratty. And then he introduced me. The kids, however, treated me like a big-name author. They asked informed questions, and the hour flew by. I never touched my copy of “Dead Jed.” Nor did I get to all the questions. About halfway through, when someone asked what it felt like to write a book, I was honest. “As you know, I’m not a big-name author. I have yet to see a dime from ‘Dead Jed.’ Last year I went to a big book convention in New York, signing postcards of the book because it wasn’t out at that time. With so many talented writers there, I felt so small. At the end, the kids lined up patiently as I signed each book. A few had their photos taken with me. It was my greatest author moment ever. If I never sell another copy of “Dead Jed,” all I have to do is think about Club Read and know that the months of writing, the years of finding an agent and publisher, were worth every second. It was hot, and he was wearing a striped shirt and blue shorts. One second he was asking to be pushed on the swing. I turned my back to him, saw that the swings were full. I took a couple of steps toward them, thinking I would ask one of the bigger kids if he would mind taking turns. Turned around, my son was gone. Maybe 10 seconds had passed. I panicked in a tenth of that time. I have never been one of these parents who think, “That will never happen to me.” I read stories about drownings and car crashes and toppling furniture. Of course it could happen to me. I took precautions to at least lower the risk. But this time, he vanished. Just vanished. He was three years old and gone. Twenty hours later, I found him. OK, it was twenty seconds. But count that out, slowly, in seconds, and see just how long it is. Then see how long it is when you are looking for your only son in a busy park. Did not yell at him for wandering off, since I should have been more attentive. He was three, after all. I was the responsible one. I thought it would ease as he got older, but it never goes way. It evolves. The worst times is when he got his license, then a car. I had him text me when he arrived, when he left, when he arrived again, then I called him, had him text me photos of where he was at. Over a couple of years it eased, and now that he is 18, I only text him when I am wondering where he is. But the old feelings come back quickly. The other night he grabbed his jacket at around 8 o’clock and said he was picking up Marissa or Melanie or some such, and that he was heading to a place south of town, some sort of overlook that I may have called Make-Out Point in my day. I woke at 1 a.m., not unusual since it seems to be vestiges of my parental warning system, largely dormant but not that night. His door was open, meaning he was not home. Where? After midnight? In a very empty, dangerous part of town? Where serial killers roam? Because I knew it could happen to me. Got out of bed because there was no way I could go back to sleep. But this was bad. I will text him. I knew that as soon as I sent off the text, I would be counting the time. Ten. Twenty. Thirty. Second. Minutes. Waiting for the screen to light, the familiar tone to chime. Incoming text. I picked up the phone, punched in the unlock code. There was a text. “Gone to see Wolf of Wall Street.” Time-stamped at 10:43. I knew the movie was almost three hours long. Heart slowed enough in the next 10 minutes to get back to sleep. That feeling will never go away. I am sure it will dim. My dad is 86 years old, and if I don’t make my daily call at the usual time, he worries. Probably the same things he worried when I was younger, but concerns have evolved to include heart attack. Stroke. Hit by a bus. I understand. And it’s OK. Comforting, even, to know there is always at least one person looking out for me. It was just a box. Nothing more. It arrived at least a month before it had to. I’d find it outside my front door, wrapped in brown paper with my address written elegantly on the front, like something from the pre-Amazon time when people did their own shipping. I took it to the patio, tearing off the paper that came off with equal parts tape. Once the box was revealed, I slit the tape and lifted the flaps, holding my breath as the strong scent of tobacco slapped me in the face. Inside was the usual. A few wrapped packages, ones my mother took so much care to make the ribbons and bows just perfect. This one had socks and underwear. That one had a long-sleeve shirt. And the other held a pair of khaki pants. Or maybe the other one had socks and underwear, and this one had a shirt, and that one … never mind, it never really mattered. Packed around the edges were stocking stuffers, the ones I was to put in my stocking and well as her grandson’s. Candy, deodorant, toothpaste, stamps, mouthwash, and of course the Lifesavers Storybook, a part of every Christmas since I could remember. I fished out the smaller wrapped box at the bottom, as I always promised Mom I would use it right away – Hallmark ornament, a lighthouse, the next in a never-ending series. I left the box outside for a few days to let it air out. The days of having to hide it from my son were long gone. That box didn’t come this year. It won’t come next year, or the year after. I tell myself that’s how life goes. Like kids getting older, like friends moving on, like families getting larger and smaller. But that does not mean my mood has to. Next year will be better, I say. Next year it will be filled with peace and goodwill and cheer. Besides, it was just a box. Measuring 8-by-5 inches, weighing 11.2 ounces, I am happy to say “Dead Jed” has been released upon the world, celebrating its official publication date today. Shortly after midnight, Eastern Standard Time, I received a note from Amazon it had been delivered to my Kindle, and less than 12 hours later, the paperback was available for shipment. Back in June, I scheduled a vacation this week, thinking I might need to devote time to a school appearance, maybe even a signing at a local book store. Last month I made the rounds, book in hand, to a few bookstores, a handful of libraries, and dished them off to some friends who knew people in schools and libraries. I sent out a few follow-up emails, hoping to get an invitation. No luck. So it turns out I will have plenty of time this week for other things. Washing my car. Walking the dog. Dusting … no, not dusting. That is most odious of all household chores. Even disappointment won’t drive me to dust. I’ve looked forward to this day for five years, from the second I wrote the first chapter. It was a combination of Christmas, my birthday and my son’s college graduation (which hasn’t happened yet, but when it does it is going to be huge). Even with those great expectations, I kept telling myself to relax, that it’s a marathon, not a sprint, that if “Dead Jed” spends days, even weeks in stealth mode, it was OK. Keep contacting bookstores and libraries and schools. Work on spreading the word. Maybe by this time next year, the book will have built enough momentum that the second book flies off the shelves, or at least from servers to ebook readers. So today will be spent quietly at home, wandering around the internet to find some early reviews, and prepping for the marathon. To put it all in perspective, I recall an event that occurred just a few weeks ago. On a very warm and pleasant Saturday, armed with a handful of brand-spanking-new books in my car, I stopped by the Phoenix area’s foremost independent bookstore — Changing Hands in Tempe. I grabbed one of the books off the pile and headed inside, and realized I had no idea who to see. I stepped to the counter, behind a mom who was buying about a dozen books for her two children who stood at her side. The daughter — mayebe 10 — and the son — around 8 — stood on tiptoe with fingertips on the counter, watching as the transaction progressed. The real beauty to this particular uninspiring encounter is I have no idea how it will turn out. All I asked them to do was tell other kids if they liked the book. I think they will, as fans of Wimpy Kid. So in my mind, this ends with them fighting over who gets to keep the book in their room, and with dozens of other kids hearing about Dead Jed. Actually, friends were shocked when they found out I’d written a book, let alone one that found a publisher and was due to come out in just a few months. Only a handful of people knew about “Dead Jed.” Word got out only when an acquaintance noticed a Twitter chat in which I’d mentioned the book. I kept my efforts to myself until I was about halfway through the book, when I revealed my secret to one person. I told Paula because I knew she would keep on me to finish it. Another three people met “Dead Jed” when I asked them to read it and provide feedback. 1. I wanted to own something. As a reporter, any number of people knew what I was working on in a given time. But the book? That was for me. 2. Fear of failure. It wasn’t as if I were a tailor who every night spent hours slaving over a legal pad, painstakingly crafting a novel in longhand. If I were, I’d Tweet about my progress about every 500 words. But I was a professional writer with loads of training and constantly learning from talented editors. If the book crashed and burned, I wanted as few witnesses as possible. By the way, are there still tailors? 3. Lack of confidence. This is “Fear of failure’s” wingman. My career is based on telling the tales of other people. Fiction was a whole other thing (regardless of criticisms over the years from folks who swore I made up stuff for the newspaper). 4. Privacy. I don’t share a lot about myself (I get the blog-related irony). I’m rarely on Facebook and when I tweet, it’s largely for work. “Dead Jed” was locked away in the brain basement for a long time. Now I’m booting him out the house hoping the world invites him in. He won’t take up a lot of room, I swear. 5. Worried how colleagues and peers would react. I work in a field where people are judged daily on their writing talents. Competition is as ever-present as compliments are rare. Given the extremely talented people I work with, I feared they would take any number of shots at a humorous, even frivolous, middle-grade book. Of course I was wrong. When word of the book got out, my colleagues were incredibly supportive. I realized how very lucky I was to be among such good people. More than 18 years ago, something very special happened that has occurred only billions of times before. A child emerged into this world and as I held him when he was minutes old, I knew I’d never experience anything more beautiful. But I got pretty close Friday. For days I’d been waiting for the literary stork to bring me my first born, until I was informed the anticipated package had not even left wherever it was books were made (a part of publishing process that remains a mystery to me, but I am sure it involves cabbage patches, magic beans and glue). Friday afternoon, when my dog Sandy delivered her “Evil is afoot” warning – a bark that accompanies doorbells, vacuums and approaching canines – I glanced outside and noticed a UPS truck. Probably just delivering more Eddie Bauer shirts to the guy two doors down, whose fashion sense is very manufacturer specific. Curious, I watched the delivery guy lift the back gate, lean in and emerge with a compact box that appeared to be somewhat heavy, due to his grunt as he hefted it to his shoulder. A box full of books might be that heavy. Could it be? He turned toward the house and headed this way. Sandy’s barking went from “Evil is afoot” to “We’re all gonna die!” as the UPS man headed up the driveway. I remained cool, continuing to stare out the window rather than rush to the door screaming, “The boosk the books the books! !” and potentially frightening the UPS dude. I counted to, something, opened the door, threw a very casual “Thanks man” to the UPS guy as he walked away, and grabbed the box. It was heavy. And the flaps bulged just a bit, as if straining to contain the awesomeness inside. More than five years ago, I’d written the first words of my first attempt at my first book. Up until this moment, it had existed as a series of electronic files. Real, but not really real. I picked up the top book, ran my fingers along its shiny-smooth cover, admired my name. You heard me. I admired my name. If there was ever a time to allow for some ego, this was it. I also am unapologetic about what I did next – opened the book to the middle to see my name atop an even-numbered page, then flipping through a dozen more pages to see my name go by over and over again. I admired my book baby, knowing it was a special moment that has occurred millions of times before.